The Color Purple Is Not for your Auto Windows, and Bubbles belong in Champagne!! Driving around the Valley of the Sun, it always amazes me to see all the autos out there with Purple and/or bubbled windows! Some of these are older, but some are not so old. 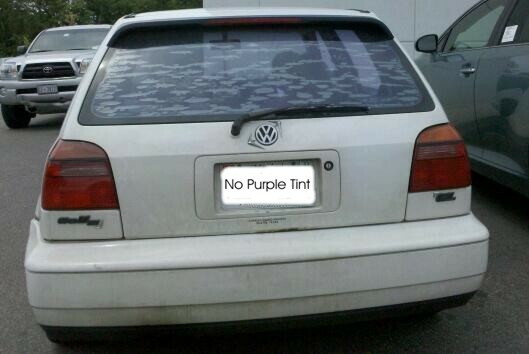 When your car windows turn purple or bubble, it has gone bad and it’s time to replace the tint! Because the sun shines 85% – 90% of the daytime in Arizona, automotive window tinting is very important. Unfortunately, there are many companies willing to take your money and give you cheap window tinting. The cheapest tint job is not the best tint job, and like any purchase, you get what you pay for. Saving a little money now, will inevitably cost you more in the future! Inexpensive window film consists of polyester film dyed to achieve the desired color and darkness. The purple appearance is caused when the ultraviolet rays from our always shining sun break down the dyes in poor quality film. Film bubbles because it is of poor quality and the result of a failure in the adhesive process. Quality window film and a professional installation will help you avoid the embarrassment of purple, bubbled windows, and save you money in the long run. WE FIX THE $99.00 TINT JOB! Made In The Shade Inc.
Where YOU Are The COOLEST! Which Window Film/Tint Brand is the best? Understanding Heat Reduction And Window Films! Bad 3M Prestige Bad! Don’t blame the Doggie! It is how you make the Film – Tint! !